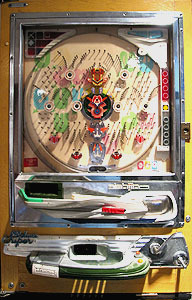 Pachinko is a Japanese arcade game. The player flips steel balls up onto the game board where they drop down through a field of pins. If they fall into certain pockets, you win a payout. In the 70's old, decomissioned machines were imported into the US privately and through distributing companies that refurbished them. These old machines from the 60's are entirely mechanical and have an cool aesthetic. Since there is minimal wiring and no electronics, they are relatively easy to repair as long as no parts are missing. We picked up our first pachinko machine at a building salvage yard in Berkely CA and then dragged it all the way back to NYC. We currently have four Nishijin Super Deluxe models. Three will hang together in out apartment and the fourth will be used for parts. The '60s Nishijin models we have all have similar cases and hardware but vary in the design and condition of the play field. For more info, see here and here.